Jack's Small Engines had fast shipping, and the Gator mulcher blades are great. Looking forward to our mowing season now! Heavy well built quality product. Have used these blades in past on other machines but was unsure how they would perform on my Snapper Pro ztr. I was not disappointed. Blades made my bagging system work flawlessly with no clogging, even mowing at fastest speed. Best investment I've made in some time. Blades are very good. Order was received very quick. Will use Jack"s Small Engines again. G5 blades are heavier and 1/2" wider than G3 blades. Only mowed once with G5 blades, appears to cut cleaner/ better than the G3 blades. Happy with the blades, no issues, would recommend the G5 Gator blades to friends. These blades are phenomenal. They are heavy duty and chop the grass up much finer than regular blades. They also create great striping compared to regular blades. I won’t go back to the stock blades again. Jacks Small Engine had quick shipment with no issues. Great blades! I’d give it 5 stars but they don’t come sharpened, so you have to get them sharpened after you receive. After that they become 5 stars! Maybe they service could be offered for a fee from Jack’s.. 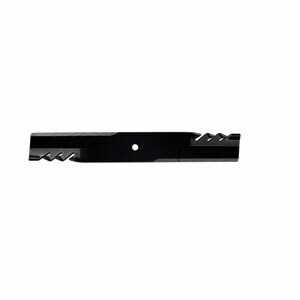 Ask us about the Oregon 596344 G5 Gator Mulcher Blade. Please no repair questions. Your Q&A may be posted to Jackssmallengines.com to help other shoppers, like you, with their purchasing decisions. Thank you. What is the difference between the G5 and G6? It looks like the G5 is thinner than the G6. So it's lighter weight. Do they both have the long cutting edge as well? Ray, yes the G5 blades are thinner than the G6. Both have the extended cutting edge, too.